Swiss hiking trails are as easy to use as the US freeways. Just a lot less stressful. Trails are well- marked, rated for difficulty and completion time, and...are...everywhere. I see people everyday getting on and off trains with their hiking poles (picture ski poles) in tow. 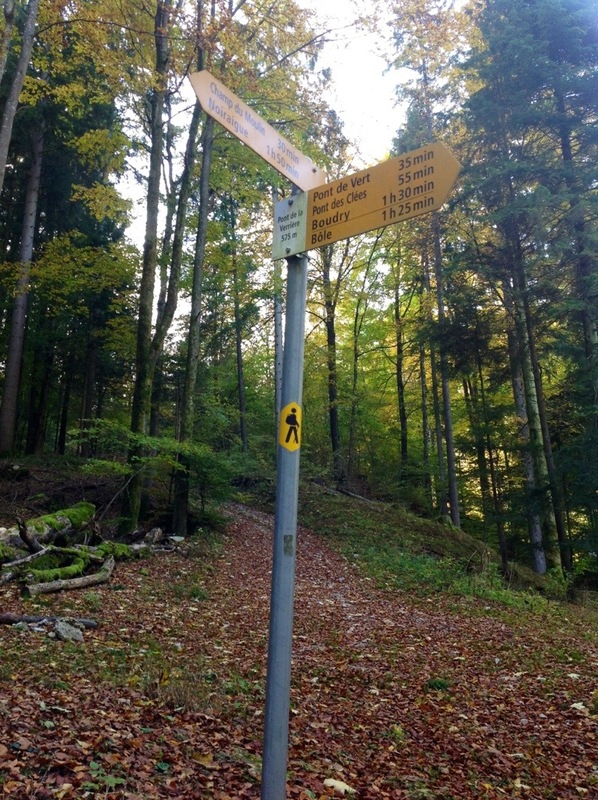 You can get off at any random train stop and you'll find at least one "Wanderweg" sign or icon (hiker with backpack and walking stick- see pictures) within eye shot begging to be explored. I keep a running list of hikes that I've read about on my kitchen table. With good, sunny weather lately, I've been trying to check off a few of those hikes. One caught my eye in particular. 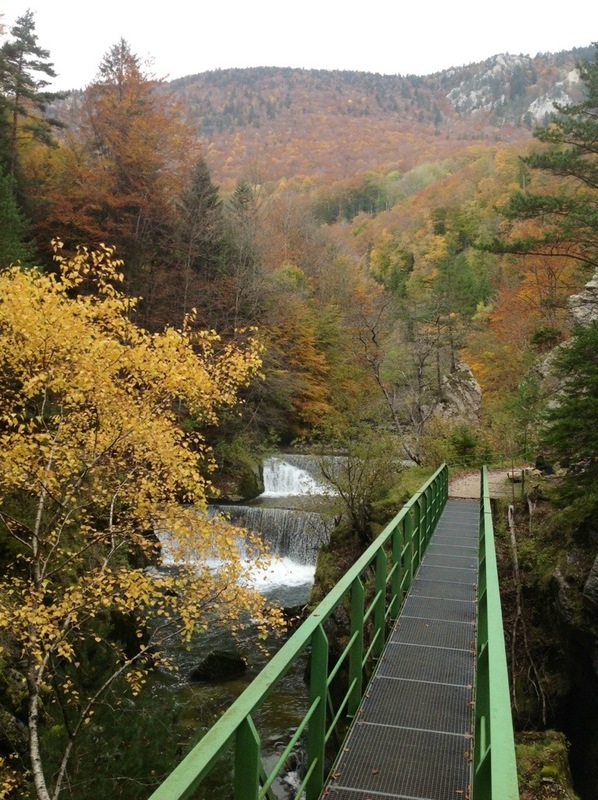 It was a three hour hike through the Areuse Gorge near Neuchatel and, boy, was it Areuse Gorge-ous! I couldn't have asked the hiking gods to create a better Fall hike. And I appreciated the contrasting landscape of the forest and wooded areas to the rolling green pastures I have become accustomed to seeing. 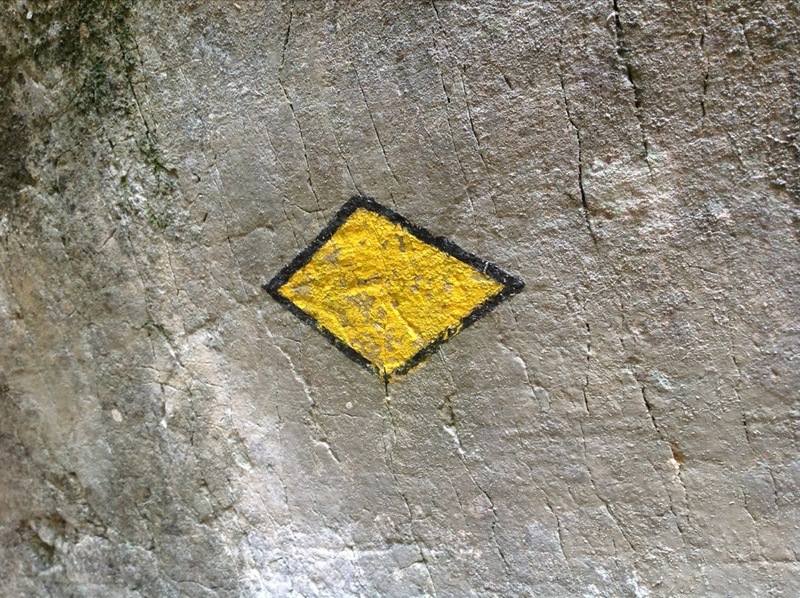 After being dropped off in the middle of mountain-y nowhere by train (I really trusted my guide book's direction on this one), I started following the trail and icons as even the most amateur of hikers can do. The trail led me on the most breathtaking hike. I followed the river and its waterfalls through this shadowy gorge that went from autumnal hues on the hillsides and crackling leaves under your feet to a green, mossy world with trees dripping with moisture. (See pictures below.) A memorable afternoon for sure. It's easy to see why hiking here could become infectious. Because there are thousands of trails around Switzerland it makes me believe that, if hiking is on the agenda, no two trips here would ever be the same. Who's with me on the next one? !